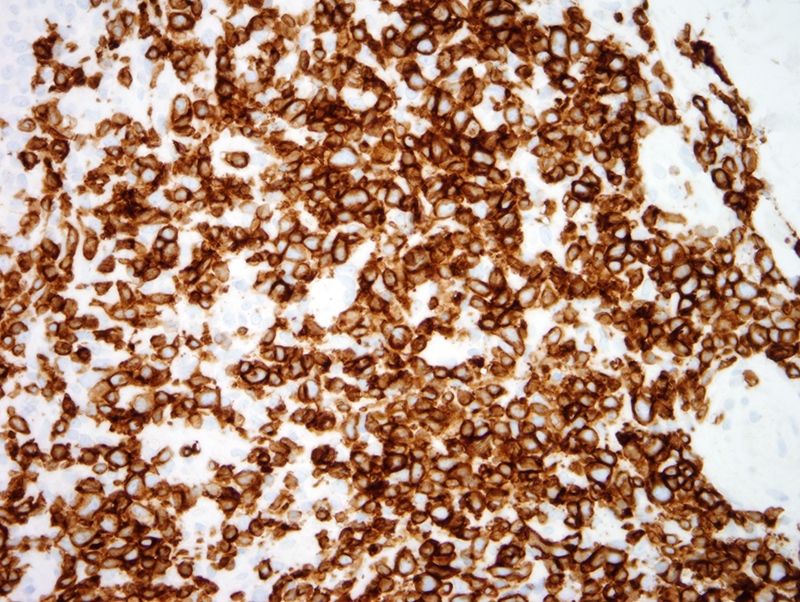 The findings are diagnostic of a non-epidermotropic CD4+ T cell lymphoma. Overall the architectural growth pattern, cytomorphology and phenotypic profile is compatible with unilesional (i.e. 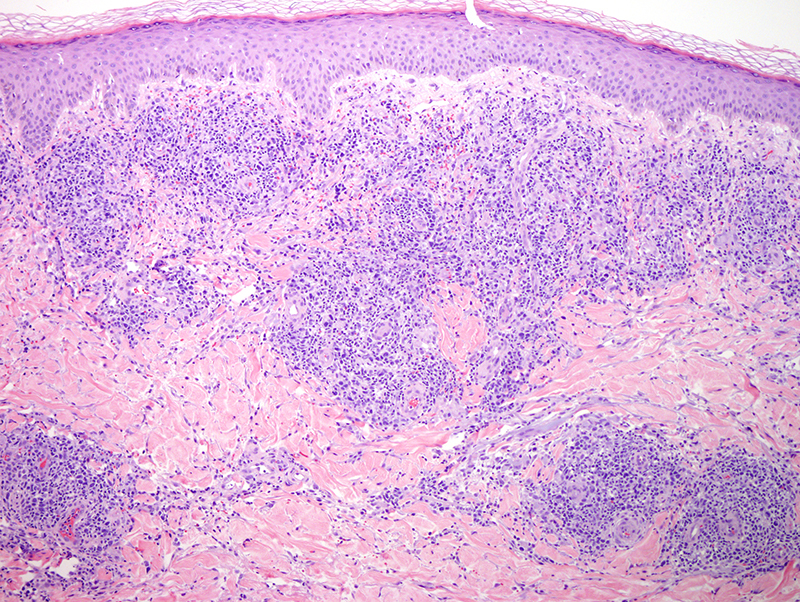 as opposed to the more common multicentric form) primary cutaneous follicular helper T cell lymphoma of which there are two main types as will be alluded to presently. 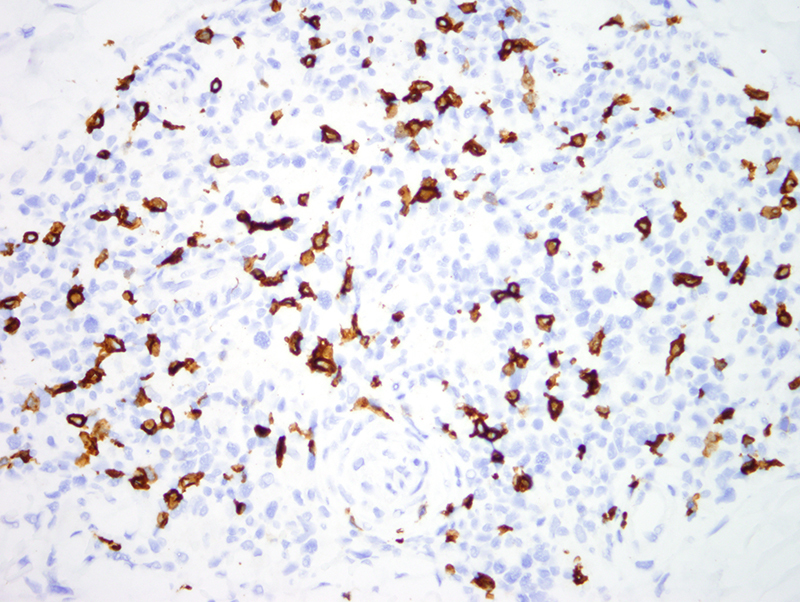 This non-epidermotropic nodular architectural disposition arranged around vessels and adnexal structures defines the basic architecture encountered in multifocal and unilesional primary cutaneous follicular helper T cell lymphoma. 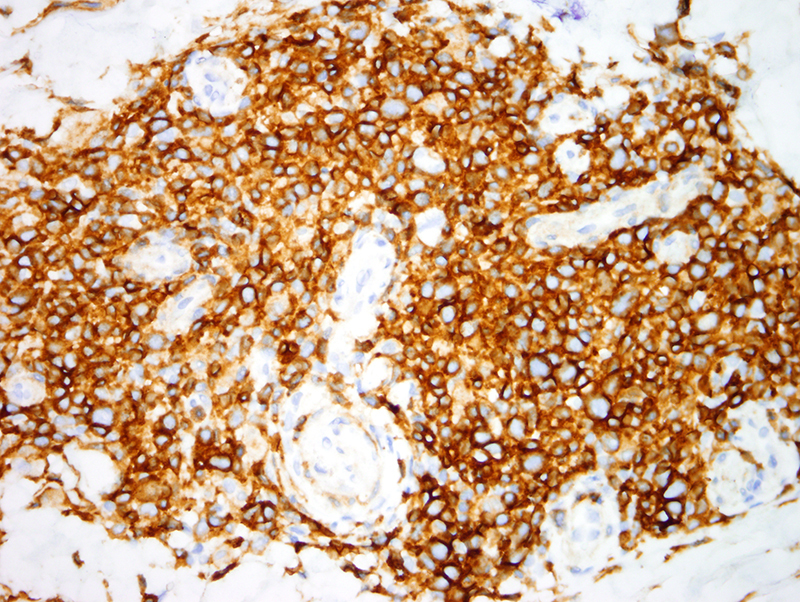 The designation as being a follicular helper T cell lymphoma relates to the extensive staining for PD1 as well as nuclear staining for NFAT amidst the neoplastic cells. 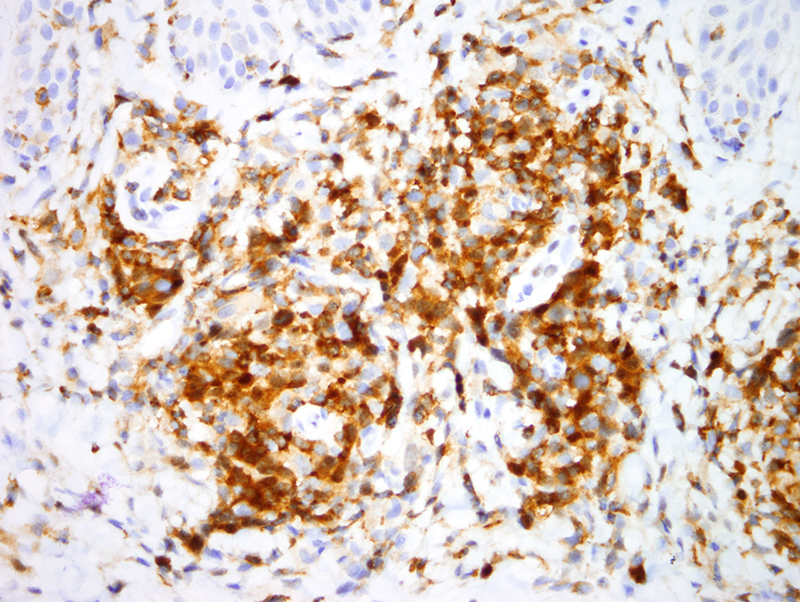 In addition it is characteristic to see a significant degree of dendritic cell hyperplasia, The fact that there are a number of large atypical cells that exceed 30% of the infiltrate is important in regards to the specific categorization. 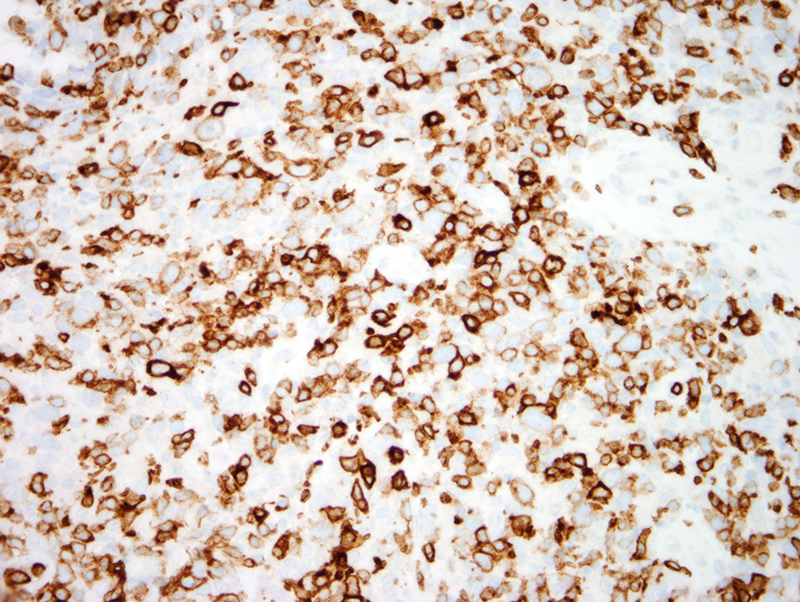 If it was a more diffuse pattern of growth then this particular lymphoma would be considered a relatively aggressive one falling under the designation of peripheral T cell lymphoma, not otherwise specified. 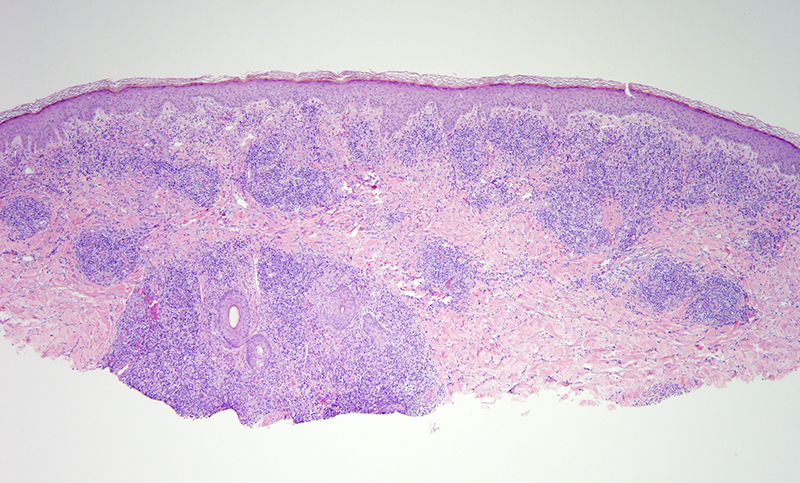 However when the neoplasm does maintain this distinct nodular growth pattern with a background of many small and intermediate sized lymphocytes my experience has been that these cases of primary cutaneous follicular helper T cell lymphoma still follow a very indolent course when presenting as a solitary lesion. 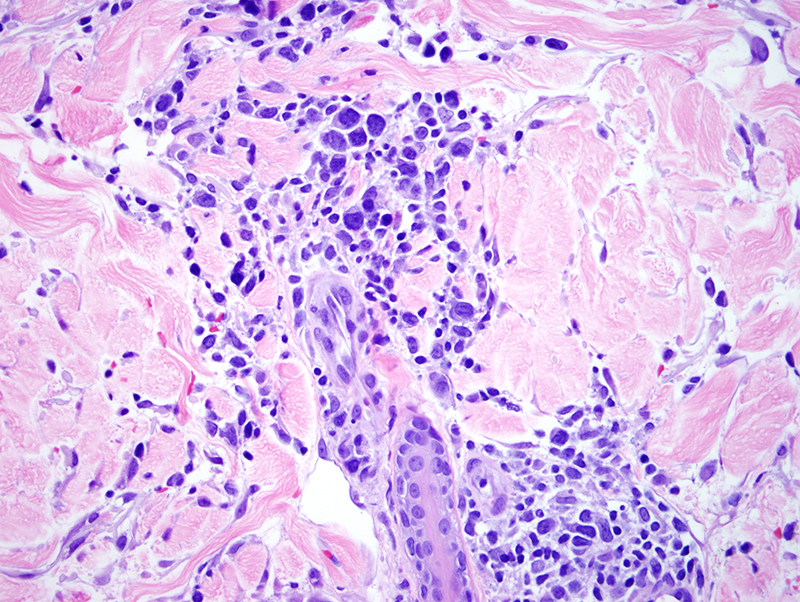 The patient does present with a solitary lesion. He is otherwise healthy. 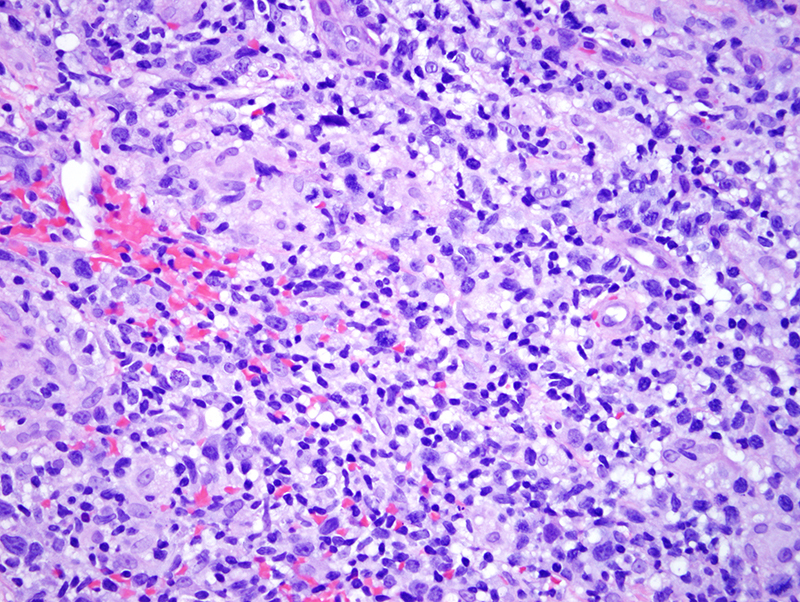 The two main forms of primary cutaneous follicular helper T cell lymphoma exhibiting this unilesional presentation with this particular nodular architecture showing a significant neoplastic large cell populace would be in the context of 1: CD30 + primary cutaneous pleomorphic small/medium sized T cell lymphoma which is a unilesional form of follicular helper T cell lymphoma versus 2: CD30 - primary cutaneous follicular helper T cell lymphoma not otherwise specified. 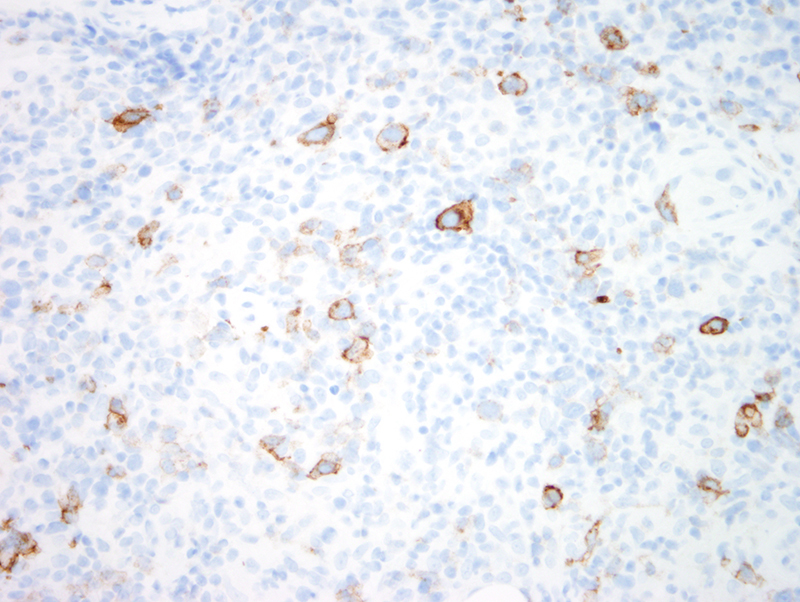 In this case I would use the designation of primary cutaneous follicular helper T cell lymphoma unilesional variant if the large atypical cells were CD30 negative. 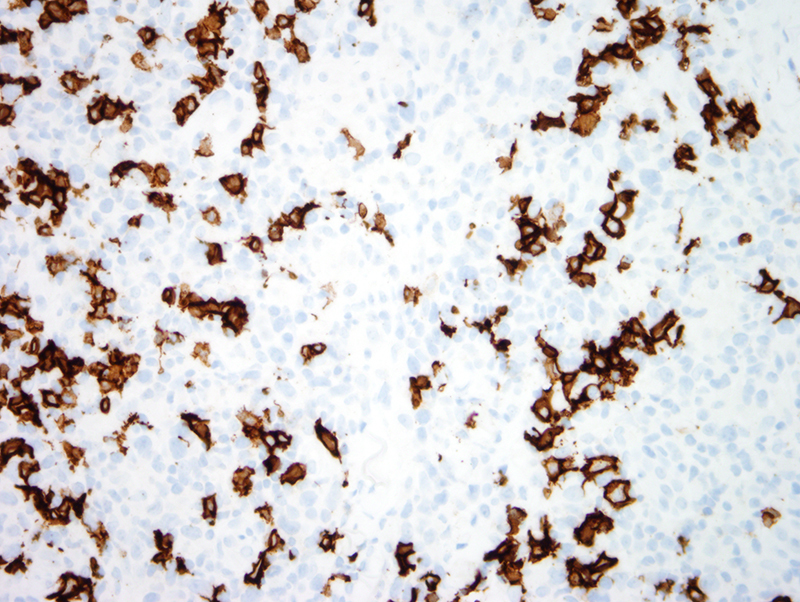 However in this case the large atypical cells express CD30. 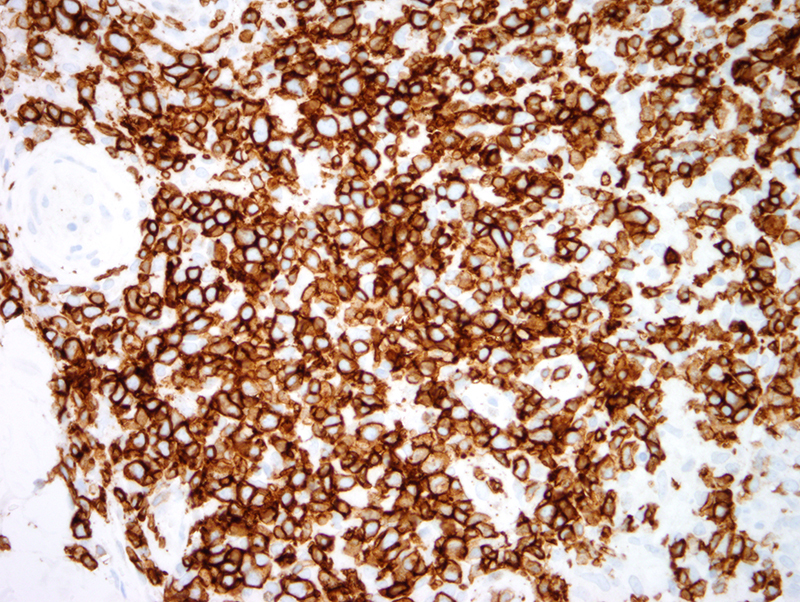 We are in the process of reporting cases of unilesional primary cutaneous pleomorphic small/medium sized T cell lymphoma that have many large atypical CD30 positive T cells that exceed the 30% large cell cutoff that defines the conventional number of large cells allowed in this neoplasm. 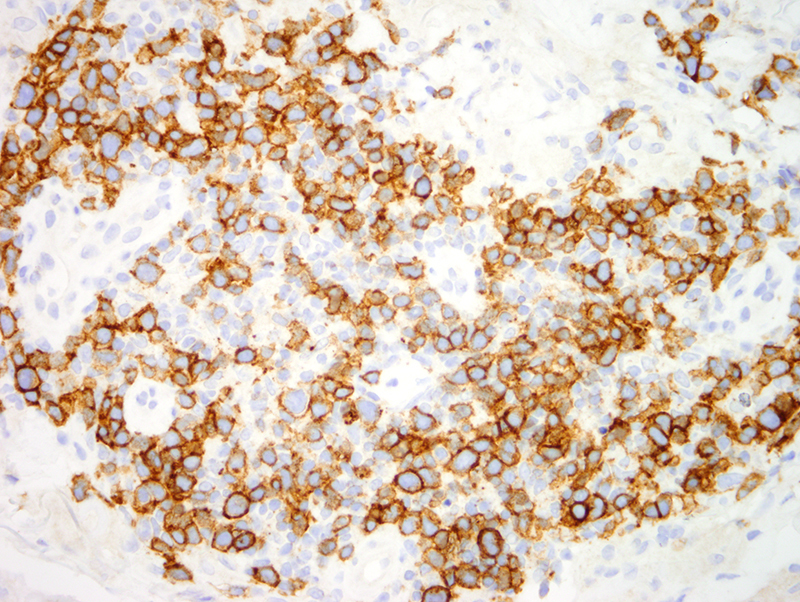 Perhaps in the future one might completely abandon the term of primary cutaneous CD4+ small/medium sized pleomorphic T cell lymphoma since it is a form of follicular helper T cell lymphoma and simply refer to these cases as unilesional follicular helper T cell lymphoma where both the CD30 negative and CD30 positive variants appear prognostically similar.